*Steve Oltman Golf School at Waltz Golf Farm will be hosting a series of Junior Golf Instructional Sessions on Tuesday evenings and Saturday mornings. Cost is $30 per session or $119 for an Unlimited Pass. Over 30 sessions will be held starting April 23rd and running into August. There is no deadline for entry, join now or later. Students can jump into the program at any time. This will be a group lesson format and a maximum of 12 students will be allowed per session. We are only accepting a limited number of participants in 2019. Check out www.oltmangolf.com for all details and instructional schedule. Tee Times for each event will be posted on the "Tee Times & Pairings" page at least 24 hours prior to the start of each event. Please plan on arriving 20-30 minutes prior to your assigned Tee Time for registration. We do NOT accommodate requests for pairings. We have started to put together our 2019 schedule. Events that have been booked and confirmed are shown below. We will continue to add events throughout the first part of the year and hope to complete the schedule by May. We are now accepting online registrations for both membership and tournament registrations. Please contact Steve Oltman at steveoltman@kojuniorgolftour.com with any questions. 2019 Membership Fee remains at $95 for the 10th consecutive year!! All event fees will also remain at the same level as when the KO tour was formed in 2009! Continuing in 2019, $20 of each membership registration is allocated for score-keeping duties. Once a parent or guardian has completed two score-keeping assignments at two different events, $20 will be refunded. Steve, Robert, Coach Dave, Emily and Jess are all looking forward to an exciting 2019 season! We truly enjoy seeing the kids progress in their games each year, it is an exciting time in their lives and we feel privileged to be a part of it. Membership applications will be accepted throughout the season. There is NO final deadline to join the KO Junior Golf Tour. We want to be the most accessible playing opportunity for all junior golfers. PGA Professionals Robert Kleckner and Steve Oltman are the owners of the KO Junior Golf Tour and started working on the planning of this tour in 2005. 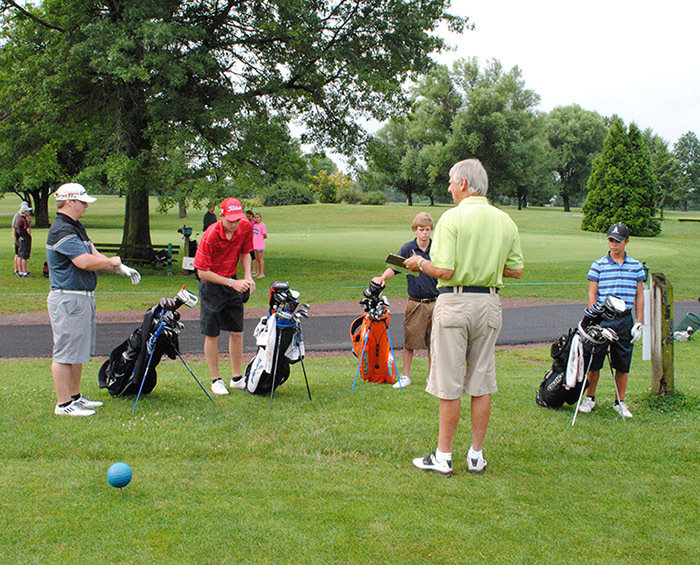 We believe in providing a place for kids to enjoy competitive golf and good golf courses close to home. Please contact Steve Oltman at steveoltman@kojuniorgolftour.com with any questions or for additional information!